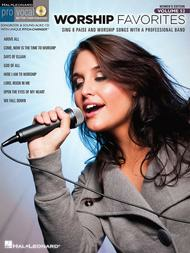 Worship Favorites (Pro Vocal Women's Edition Volume 52). Composed by Various. For Voice. Pro Vocal. Softcover with CD. 40 pages. Published by Hal Leonard (HL.740430).ISBN 1423483855. 9x12 inches.Whether you're a karaoke singer or preparing for an audition, the Pro Vocal series is for you. The book contains the lyrics, melody, and chord symbols for eight hit songs. The CD contains demos for listening and separate backing tracks so you can sing along. The CD is playable on any CD, but it is also enhanced for PC and Mac computer users so you can adjust the recording to any pitch without changing the tempo! Perfect for home rehearsal, worship use, auditions, corporate events, and gigs without a backup band. This volume includes 8 songs: Above All • Come, Now Is the Time to Worship • Days of Elijah • God of All • Here I Am to Worship • Lord, Reign in Me • Open the Eyes of My Heart • We Fall Down. Worship Favorites (Instrumental Play-Along for Trumpet). Composed by Various. For Trumpet (Trumpet). Instrumental Folio. Softcover with CD. Hal Leonard #842505. Published by Hal Leonard (HL.842505).ISBN 1423499336. 9x12 inches.